The fast, easy way to upgrade a hard drive or solid-state drive. This kit makes it easy to upgrade your hard drive or solid-state drive to a larger drive. It includes a cable for connecting a 2.5" SSD or notebook hard drive to a USB port, and automated software for copying hard drive data. 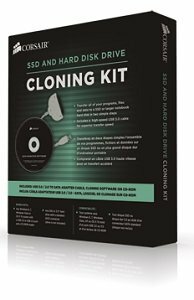 Cloning your old drive's contents frees you from the time-consuming task of reinstalling your operating system, applications, and data on your new drive. Unlike desktop PCs, you can't just add a second internal drive when you run out of space. 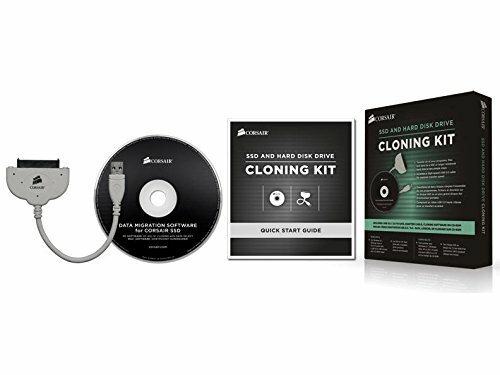 The Corsair SSD and Hard Disk Drive Cloning Kit makes it easy for you to swap out your old drive for a larger one. Just attach your new SSD or hard drive to your notebook's USB port using the included cable, run the software, and then replace the old drive with your new one. The USB interface has a transfer rate that's about 4.5 times faster than USB 2.0. If you have a newer system with a USB 3.0 interface, the included USB 3.0 cable will allow you to take advantage of its superior performance. Using an older system? No problem. The cable is backward compatible with USB 2.0 ports. Clone and transfer your data in 2 simple steps: Select source drive and destination drive, click "start clone", simple as it is.